Last week we reported that British Sky Broadcasting Group's Google Play apps and Twitter account had been compromised by the Syrian Electronic Army, a fringe group of hackers and digital vandals in support of the current Syrian government. After the hack was discovered, Sky's apps published under the BSkyB label were removed from the Play Store. Sky reports that the app descriptions were defaced, but the apps files (APKs) themselves were never replaced. 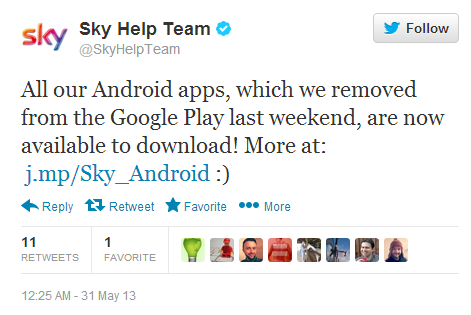 Sky now has control of its Twitter account, and has sent out a message saying all its Android apps have returned. That includes digital streaming service Sky Go, movie rental and purchase service Sky Movies, sports news app Sky Sports TV, and programming guide/manager Sky+. All apps have had their descriptions restored to their states before the hack on May 25th. It appears that United Kingdom Sky customers who had already downloaded the apps before the hack were never affected - only those who tried to download the app during the six-day period ending today were denied access to Sky's mobile services on Android. Sky is mum on the subject, but it's generally believed that the company's access to one or more of its own email addresses was compromised, which would explain the nearly simultaneous Twitter and Google Play Developer breaches.